Monsters We Are . . . Imagine what it would be like to live forever – to be immortal. You feel the blood-hunger that drives the hunt. Your mouth waters in anticipation of the kiss. Your need washes over you and pushes you to the edge of frenzy. Are you strong enough to keep the Beast at bay within your dark soul? 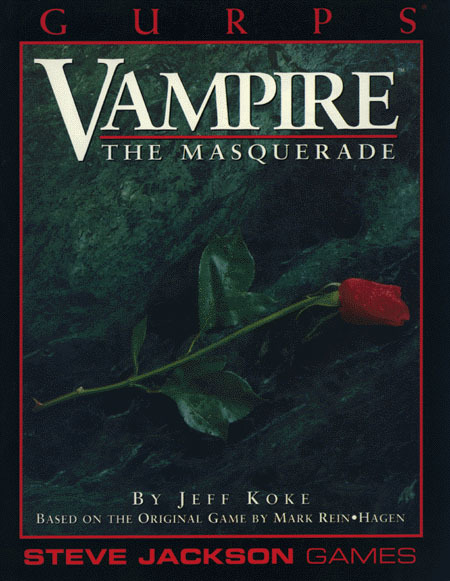 Within this book, a world of darkness awaits. A world where ancient vampire lords use their subtle machinations to control their unsuspecting minions . . . while within the bleak cities, Kindred princes flaunt their power, and the elders sway the prince. Little do they know that they are but pawns in the Jyhad – the invisible war that has raged for centuries. You are a member of this hidden society. You are Kindred, childe of the Blood – one of the Damned. You will never grow old, but your unending existence is a constant struggle to control your Beast, to feed your hunger for the blood of mortals, and in the end to keep some measure of humanity. Whether you are of the noble Ventrue, the insane Malkavians, the brutal Brujah or the clanless Caitiff, you are of a select breed. And endless adventure waits . . . just beyond the coming of the night. 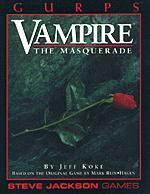 GURPS Vampire Companion – New Disciplines, advanced Disciplines for older vampires, and all the new clans and bloodlines from the Vampire Player's Guide and the Player's Guide to the Sabbat, including an entire chapter on the diabolical Sabbat, their history, motivations and tactics.